Project Based Learning (PBL)Project Based Learning (PBL) is contextual, creative, and shared. As a part of the New Tech Network schools, students at Carolyn Clark Elementary School collaborate on meaningful projects that require critical thinking, creativity, and communication in order for them to answer challenging questions or solve complex problems. By making learning relevant to them in this way, students see a purpose for mastering state-required skills and content concepts. Students aren’t just assessed on their understanding of academic content, but on their ability to successfully apply that content when solving authentic problems. Through this process, project based learning gives students the opportunity to develop the real life skills required for success in today’s world. New Tech Network schools also use Problem-based learning. PrBL is a form of inquiry-based instruction used primarily in Mathematics that places the students in several smaller Problem scenarios rather than a single, large Project scenario. Supported by National Council of Teachers of Mathmatics and the National Science Foundation, much of what makes PBL so successful is present in a PrBL environment, including Entry Events, the Need-to-Know (NTK) process, and student-centered scaffolding. Watch a short video on Project-Based Learning Success, Start-to-Finish. Watch an in-depth tutorial video on PBL: Tutorial – What is PBL? To learn more about PBL in our classrooms, examples of PBL projects are available to read about below. January 2018 - Driving Question: We need more colors to paint a rainbow. What colors do we need? We had the primary colors, red, blue and yellow. We needed the secondary colors. How can we get more colors? We mixed 2 primary colors to get a secondary color. Red and yellow made orange. Yellow and blue made green. Red and blue made purple. January 2018 - Driving Question for Haunted Houses/ Castles PBL was: What can we build or create to show others that shapes are all around us? December 2017 - Shapes Project: What can we build or create to show others that shapes are all around us? December 2017 - Kindness Project: How can we be kind? How can we construct a building that will withstand natural elements? How can we design and build a house for the Fourth Little Pig which will stand up against wind? Third - How can we increase the food supply of bees in our community? How can we, as individuals, prepare ourselves and our families to be as safe as possible before an earthquake, secure as possible during an earthquake, and reactive after the earthquake to avoid more loss and devastation? December 2017 - Mission Project: How can we choose a good site and design for a new mission so that it will meet the historical goals of the church and Spain in California? How can we design a contraption that moves a ping pong ball 1 meter, rings a bell, or increases a water level in a container by 2 centimeters? February 2019 - We are three 4th graders from Mr. Milinovich's class. We are doing a PBL about how to prevent hearing damage. Our driving questions is: How can we prevent this generation from experiencing hearing damage? 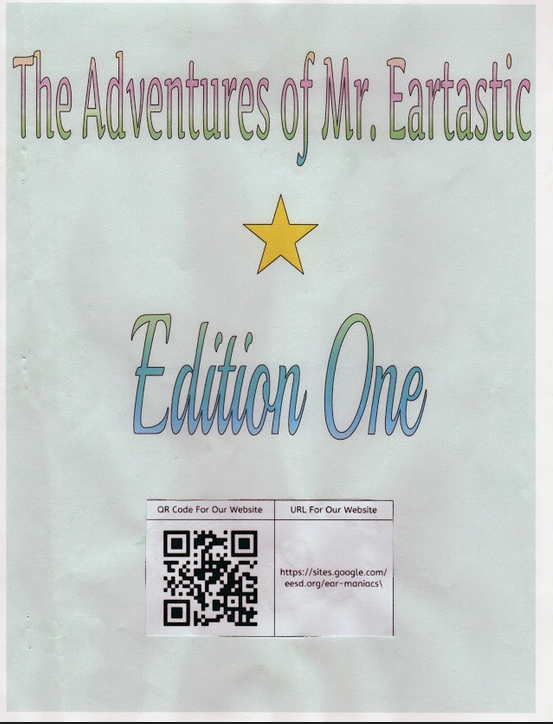 The 4th graders created a website called Ear Maniacs. 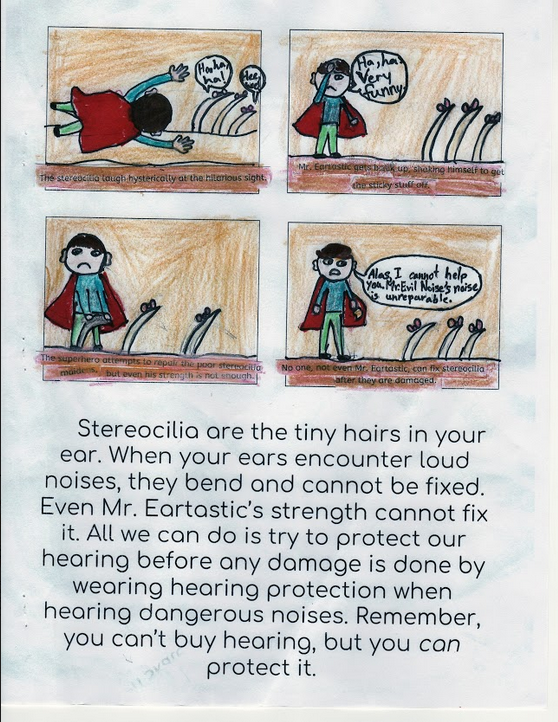 Our group also made a comic to explain that once you lose your hearing not even a superhero can get it back. On the cover of the comic, there is a link and a QR code to our website. Please visit our website and protect your hearing. Thank you! Mission to Mars: How can we create a successful mission and sustainable economy on Mars? December 2017 - Empathy Museum: How can we encourage empathy and understanding for the immigrant experience?